These days, a trip to your local supermarket has become a whole lot more than just buying your week’s groceries and household essentials. It is now a chance to have your and your family’s teeth looked at as well. Sarah Carr is a dental hygienist who spends part of her time working at Centre for Dentistry, a practice situated close to the checkouts inside the Sainsbury’s store in Wakefield. Centre for Dentistry is a chain of practices open six days a week within a number of Sainsbury’s stores around the country, offering private dental treatment for the whole family at affordable prices, and at a time that’s convenient for everyone. Sarah has been working at the Wakefield practice since it opened in 2014. It offers a full range of dental services from simple remedial work through to the creation of bright, white straight smiles and implants, and Sarah’s role as a hygienist is key to treatment success. 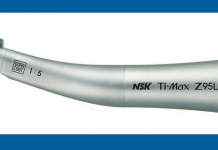 Here she talks about why the NSK Prophy-Mate neo is such an important part of her work. “Advising my patients about good oral health is a really important part of my role as a hygienist. Many patients know that teeth can become discoloured through ageing and smoking, but are not necessarily aware that their diet, including red wine and coffee, can have a detrimental effect as well. “Today’s patients are very keen to have brighter, whiter teeth, partly driven by the celebrities they see on TV and in the media with glamorous and, no doubt, expensive, ‘Hollywood’ smiles. Whist we offer teeth whitening as one of our many services, not every patient can necessarily afford to have it done, so this is where air-polishing treatment can really help. “I am a big fan of NSK’s Prophy-Mate neo and FLASH pearl® powder to get outstanding cleaning, whitening and polishing results for my patients. Many patients have said to me that they couldn’t believe their teeth could look that good again after treatment. 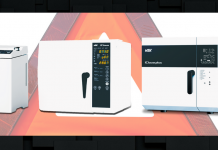 Even in difficult cases such as heavy smokers with 20-year-old stains, this combination still does a great job. I would also recommend using it prior to any whitening treatment because it removes stubborn surface stains and gives a far better whitening result. “Compared to previous, heavier air polishers I have used, the Prophy-Mate neo is really lightweight, with an ergonomic design that makes it easy to hold, really reducing the strain on my hands and wrists as I work. I find the 360° swivel is really good; it is very responsive to every movement and makes it far easier for me to do a good job. It also has easily detachable twin nozzles that make for much more efficient polishing and effective treatment. “With the Prophy-Mate neo I use both the 60° and 80° tips. The 60° tip is great for molars and occluding surfaces and the 80° for treating the anterior teeth. “FLASH pearl® powder is the ideal combination to use with the Prophy-Mate neo. Previous powders I have used I found to be much harsher on the gum line, but with unique, round calcium crystals, FLASH pearl® is much gentler on the gums. Patients really enjoy the treatment and they are always happy with the results. 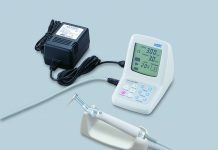 “Cleaning and maintenance of any equipment is important, so I make sure that I use the pins and brushes to easily clean out the Prophy-Mate neo after each patient to prevent any risk of clogging. Other air polishers I’ve used have all had a tendency to block very easily, but I have not had any problems with the Prophy-Mate neo. It is very reliable. 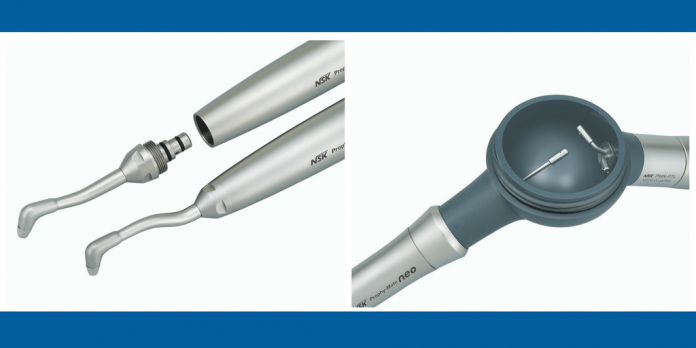 NSK’s Prophy-Mate neo is a proven ergonomic and easy-to-use air-driven dental air-polishing unit that makes routine cleaning and polishing procedures easier and more efficient than ever before. Prophy-Mate neo is a compact and lightweight system which includes both 60° and 80° tips, maximising cleaning even in difficult-to-reach areas. Its 360° easy swivel offers stress-free and comfortable use. The system is ultra lightweight and portable and includes a transport case. Combined with FLASH pearl®, a spherical particulate calcium powder, which is specifically designed to roll smoothly over the tooth surface leaving no area untouched, it quickly and safely removes stains, plaque and calculus to give sparkling results every time. 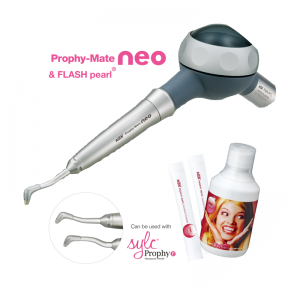 NSK is so confident that practitioners and hygienists will be delighted with the results achievable with Prophy-Mate neo that it’s offering a no-obligation 10-day ‘try before you buy’ introduction.